Hardcover, 9 x 9 in. / 120 pgs / 68 color / 14 bw. 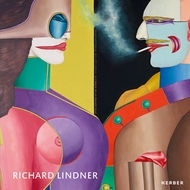 A pioneer of the German Pop art movement, Richard Lindner (1901-68) portrayed characters from the margins of society--particularly thieves, prostitutes and gamblers. With 50 paintings, watercolors and drawings, this catalogue provides insight into his creative phases from the 1950s to the 1970s. FORMAT: Hbk, 9 x 9 in. / 120 pgs / 68 color / 14 b&w.